The new wetland’s water level greatly increased since it was originally restructured, so there were plenty of mud flats. A ton of Killdeer and a few Spotted Sandpiper were enjoying the plethora of tasty meals made possible by the mud. I also saw a new bird I’d never seen before catching bugs. 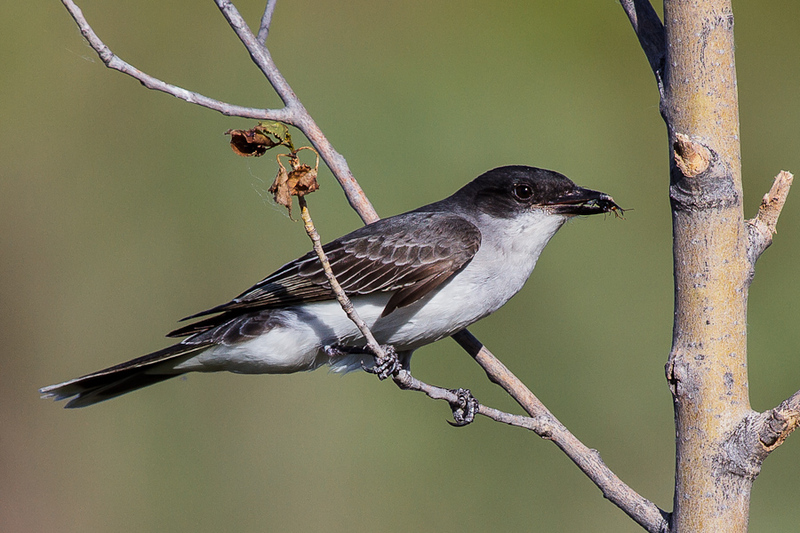 Turns out it was an Eastern Kingbird. I also encountered three separate species of heron…a couple Great Blues, some Night Herons, and of course Snowy Egrets. Anyway, on to the photography. I have far too much to show in a single blog, so I’ll be breaking it up into multiple parts. 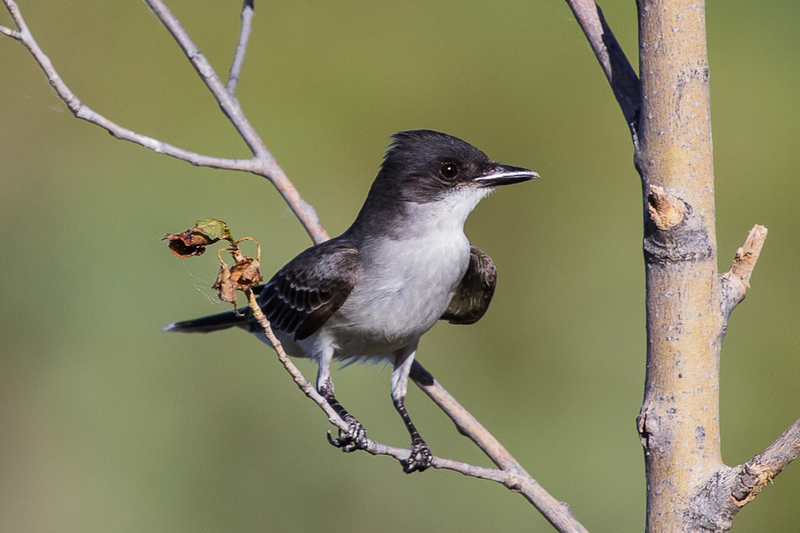 Today its the Kingbirds. 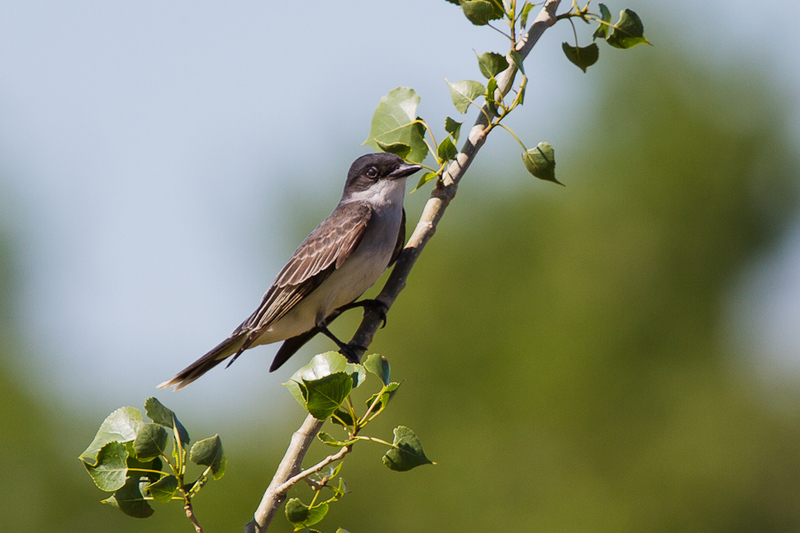 The first birds I saw after hauling my camera out of the car were the Kingbirds, in this case Eastern Kingbirds. Dark on top, light gray on bottom, they filled all the newly planted trees lining the wetlands area. They would hang out on a branch eyeing the sky for a meal, then dart out, often performing rather amazing feats of areal acrobatics to catch their prey, then head back to their perch. There must have been a dozen of them at first, although over time they seemed to spread out more around the wetlands, and some of the areas, due to the recent heavy rains, were unreachable from flooding. 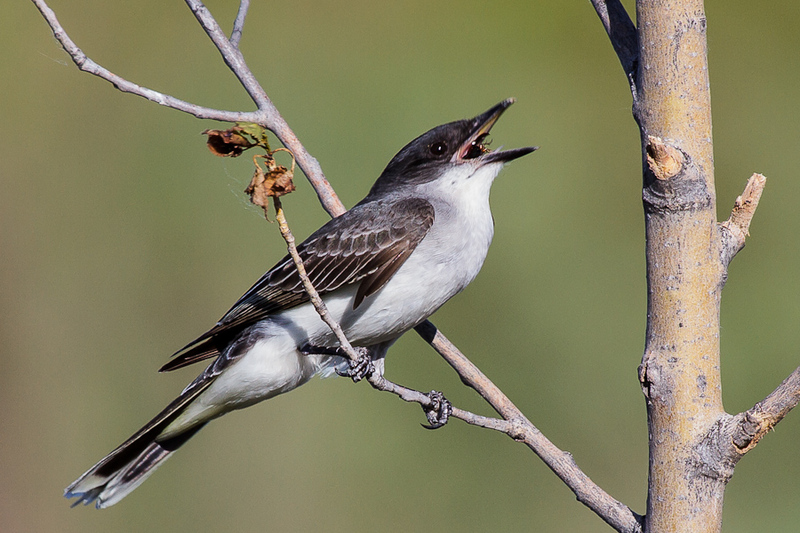 One Kingbird in particular gave me quite a number of excellent poses and photographs. 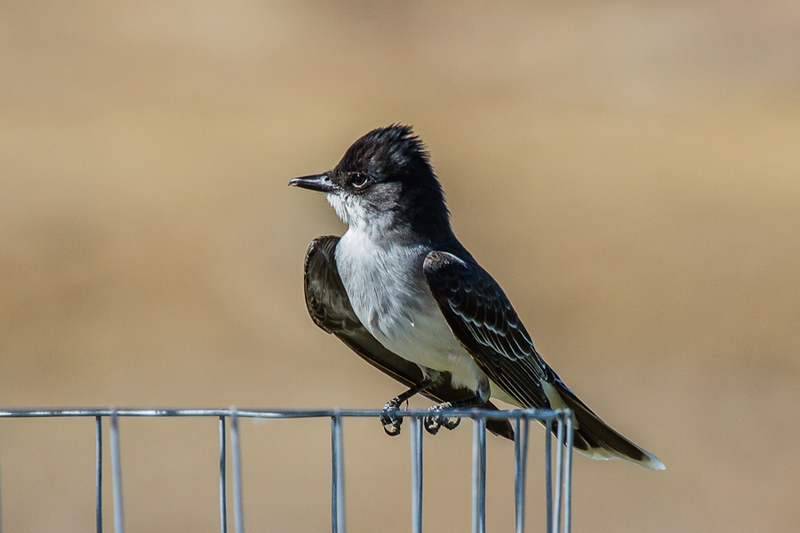 I love the little plum of feathers that tufts up over their head when they are being particularly observant. I also like how their wings are always perched at the ready, so they can fly off at a moments notice. Gives these birds a significant part of their character. I kept trying to catch them while they were in flight. I’d zero in on one when it was perched, and try to track it from the moment it jumped off its perch to catch a bug in flight. 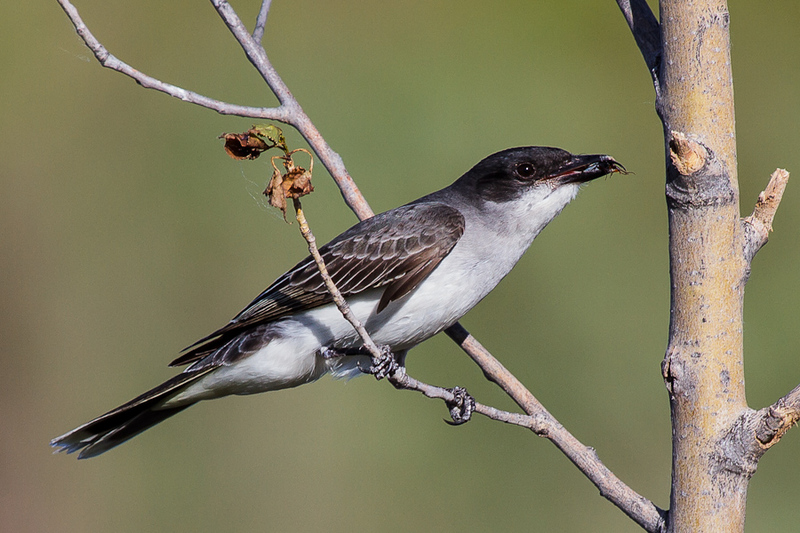 As a side note, I think one of my favorite bird shots that I’ve taken so far is the first one below here…Kingbird on a Branch. I love this shot…compositionally its great with the diagonal branch, the green leaves nicely compliment the green and light blue boke on the background. Its all nice and sharp, too! As you can see, the before and after are great, but the bird in flight is completely blurry. 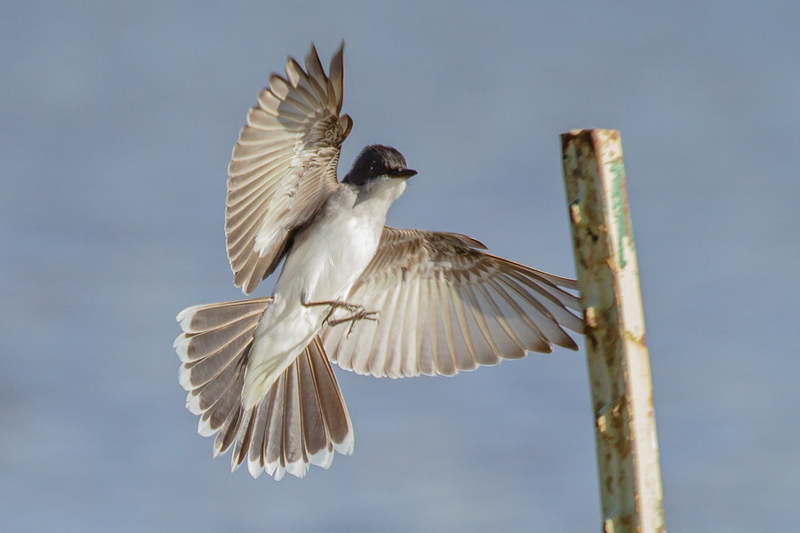 I’d probably need a 1/2500 shutter speed and an f/10 aperture to really capture a Kingbird in flight properly, which a rather rare thing to achieve (needs a LOT of light.) 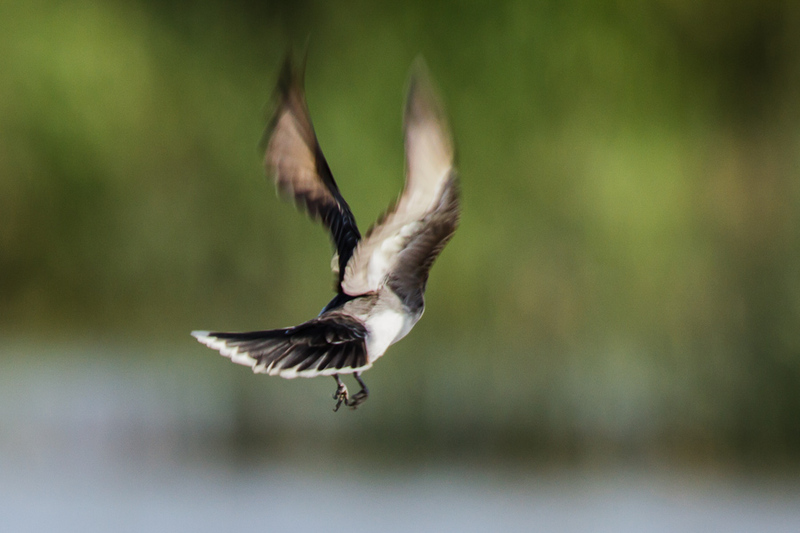 I kept trying though, managed to capture some interesting blurry flight shots with interesting boke. I actually like the first one…almost looks like a painting, maybe oil or gouache. After a few more shots managed to catch I decent flight shot as one was coming in for a landing. He was lined up just about perfectly with the sun to really illuminate his wings, full angel spread, as he came in to land atop one of the metal stakes holding up some of the newly planted trees. More tomorrow. 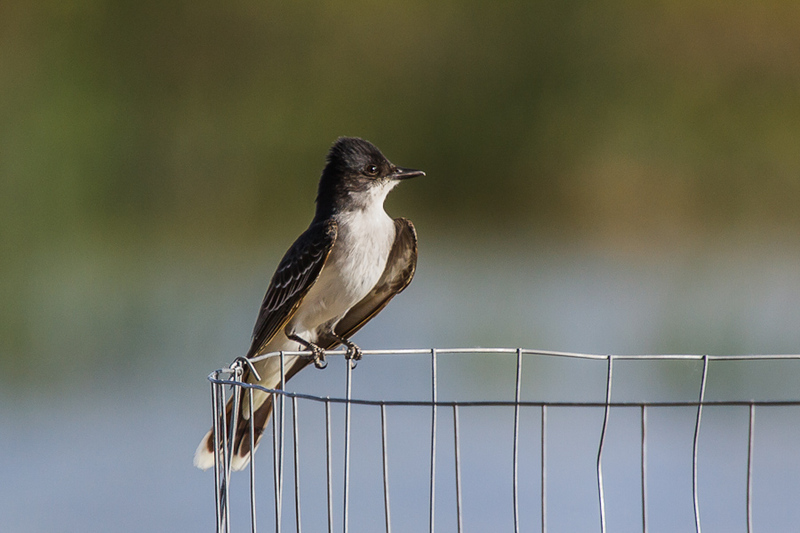 I’ll probably make this a three-parter, “Kingbirds”, “Herons”, and “Waders & the Rest”.